The government's plans for boosting horticulture to earn foreign exchange do not take into account the hidden costs of deforestation, fertiliser and pesticide use and heavy water consumption. Keeping in mind this and the fact that the poor can seldom afford fruit, isn't it time to stop subsidising dessert for the rich? WHEN GOD forbade Adam and Eve from eating the apples from the Tree of Knowledgehe probably had environmental interests in mind. But Eve couldn't resist the temptationand neither could Adam. Too bad. The price for their folly is still being paid. The Indian governmenttooit seemscan't fight temptation. Encouraged by successes in boosting grain outputit is setting its sights on a new Green Revolution: horticulture. For fruitthe attraction is foreign exchange. Other benefits are citedincluding improvements in nutrition and farmers' incomes and opportunities for processingbut the driving force appears to be the scramble for exports. Unfortunatelythough everything in the garden looks rosythere is a worm in the fruitin the shape of environmental costs. As usualthese costs tend to be ignoredor downplayedas an inevitable part of the price of profit. But their impacts range wide and deep. The loser in all this will be the governmentwhich shells out huge development costs and subsidies to grow fruit. The winners will be the rich in India and abroadwho get fresh fruit at subsidised prices. Vir Singh of G B Pant University of Agriculture and Technology in Tehri GarhwalUttar Pradeshestimates 670ha of land in the central Himalaya will be stripped of oak forests in the 1990s to make way for apples. A paper by SinghJ P Bhatti and L R Sharma says the spread of apple cultivation has led to non-sustainable use of land resourcesgenerating inequality in the farm sector and encouraging commercialisation of common property resources and forests. India is the third-largest fruit producer in the worldbut scarcely figures in international tradewith barely 1 per cent of the global total. Planners cast envious eyes on countries such as Brazilwhich racks up Rs 792 crore a year from orange juice concentrateand the Philippineswith receipts of Rs 106 crore a year from canned pineapple exports alone. In comparisonIndia earns Rs 58 crore from overseas sales of all processed fruit and vegetables. Ambitious plans Horticulturallysays Dr K L Chadhadeputy director general at the Indian Council of Agricultural Research (ICAR)Nature has placed India in a position of advantage.His talk of a horticultural revolution encapsulates the government's ambitious plans to reap the fruits of the land. G L Kaulassistant ICAR director generalis equally positive: "Fruit crops provide more incomegenerate employmentincrease biomass and maintain ecological balance by lowering temperaturereducing stormsconserving soiltranspiring water and improving soil fertility." Despite the benefits the environmental costs to be paid for producing more fruits include deforestation to make place for orchards and provide wood for boxesloss of soil fertility through monocropping and massive fertiliser useescalating pesticide applicationsand heavy water consumption. In the vineyards of MaharashtraKarnataka and Andhra Pradeshfor exampleapplications of 30kg of fertiliser per ha have polluted groundwater and built up salinity in poorly-drained soilsas well as damaged the crops. Yetsome cropssuch as guavareceive hardly any fertiliser. Such specific problems can be tackled by direct intervention and several long-term experiments are under way to pinpoint correct fertiliser doses for various crops. But large-scale expansion is bound to increase misuse and overuse of fertiliser and pesticidesespecially since current yields work out to less than 10 tonnes per haone of the lowest in the world. Daksha Guptaa scientist with the Himachal Pradesh Pollution Control Boardadmits the harmful effects on apple orchards of excessive pesticide and chemical fertiliser use have not been monitoredthough she says a study will be commissioned soon. Pesticide residues are always an important issue in food exports. Several shipments of Indian produce have been rejected after identification of residues. Such cases are usually an indicator of far more widespreadeven if unidentifiedhazards for local consumers. Water is a major problem. To produce one kilo of dry apple matter610litres of water are needed. Surface irrigation has caused considerable damage to orchards and encouraged the growth of weeds and diseases. Drip irrigation has become standard among progressive growers of grapes (for which water volume can be cut 60 per cent)pomegranates and coconut. Work at Coimbatore in Tamil Nadu has shown that drip irrigation can reduce water use by 40-70 per cent for bananas and papaya. But its installation needs capitalpushing it beyond the means of most growers. The result is falling groundwater levels. In the banana-growing district of Jalgaon in Maharashtraso much water has been used to irrigate the thirsty cropthe groundwater level has fallen to the point at which extraction should ceasebut exploitation continues nevertheless (See box). The orange-growing area of Amravati illustrates another unwelcome side-effect: In a classic example of taking from one hand to pay the otherthe demand for crates to pack the oranges is being met by cutting mango trees (See box). P V Narayanandirector of the Indian Institute of Packagingsays wood is still the most popular material for packing fruit. Thishe sayscauses "large-scale deforestation and it is time alternative materials are popularised". Wooden crates continue to be used because there is no check on illegal felling: "Since illegally chopped wood is easily availablecrates are sold at throw-away prices. In additionthere are no standards to be maintainedso no two crates are the same in quality. That's why crates are available for as little as Rs 2when in a city such as Bombaywood costs almost Rs 140-150 a cubic metre." Use of corrugated fibreboard is increasing. But Narayanan points out that although "what is called eco-friendly packaging must be encouragedprogress is slow". Grapes are usually packed in corrugated fibreboard cartons and sent directly from production centres to retail markets. But almost half of all apples and mangoes are moved to processing centres in bulk. Both the institute and the ministry of food processing are experimenting with durable 10-kg and 15-kg corrugated fibreboard boxes. One reason for the slow switch from wooden apple crates is cost: There are taxes on cardboard and paperbut not on wood. "The world over18kg corrugated fibreboard cartons are used for apples. This is gradually coming into use in Himachal Pradeshbut much more needs to be donesays Narayanan. Plastic corrugated board and polymer-based materials are also being tested, but they have proved to be unprofitable unless returned for re-use. Plastic, according to Narayanan, costs almost three times more than cardboard and is not particularly eco-friendly. IIP and the Agricultural and Processed Food Products Export Development Authority have developed paper-based packaging for mangoes, grapes and strawberries in both domestic and overseas markets. Such packaging is not re-usable, but can be recycled. 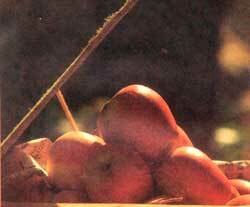 The Forest Research Institute in Delhi is testing the use of pine-needles for packing apples. Combinations of jute and plastic are also being investigated, as well as jute felt. Narayanan says the latter seems promising, but its cost-effectiveness needs to be demonstrated. Asked about government concessions on the use of alternative packaging material, Narayanan says industry itself could increase its profit margins by improvements in packaging. In Northern countries, however, there are partial excise waivers for the use of corrugated fibre board. To gauge the potential environmental impact of a fruit boom, the obvious place to look is the apple bowl of Himachal Pradesh, the pioneer of commercial fruit development in India. Annual fruit production grew here from 1,200 tonnes on 800 ha in 1950-51 to 500,000 tonnes on 1,34,985 ha at the end of the 1980s. The expansion was initially driven by the government perception that climatic and land conditions made high-value crops the best choice for hill farmers. About 60 per cent of this area is owned by medium-range farmers, with 2-10 ha of land. Small farmers cannot afford the expensive management technology of apple orchards. The growth graph in the state has not been even. The increased production created severe marketing problems, which a 1988 workshop, sponsored by the Himachal Pradesh University-International Centre for Integrated Mountain Development, described asoften disastrousruining the farm economy and worsening the conditions of farmers". These problems led to the creation of the Horticultural Produce Marketing and Processing Corporation (HPMC)whichin its first decadeachieved major improvements and won national and international awards but turned in a financial performance generously described at the workshop as "feeble." Even todaystate MLA Vidya Stokes describes storage and marketing facilities as "a shambles" and attributes it to the government's failure to invest in infrastructure. The hardest-hitshe saysare the "small growers who cannot hold onto their crop for long and therefore have to sell at depressed prices to middlemen." Poor marketing infrastructure has also affected other fruit in the state. Two years ago1300tonnes of galgal was thrown away by the HPMC because it was unable to market them. Rapid expansion has brought a lot of unsuitable land under apple cultivationwhich is one of the hidden costs of the fruit boom. Field crops formerly grew on about a quarter of the apple area. Large areas of oak and deodar have been cleared to make way for applesand to a lesser extentpotatoes. Virendra Sharma of the state council for sciencetechnology and environmenthas confirmed that encroachments occurred on forest landparticularly in Shimla district. Early encroachments in JubbalRohru and Chaupal divisions involved tampering with forest and revenue records. Even the masabithe most sacrosanct among revenue records. These were alteredmaking it difficult to book the encroachers. Reserve forests have lost ground to the apple-growers. The authorities are unable to take effective action because the political pressure to ignore or regularise encroachments is considerable. According to Srikant Baldijoint secretary for revenue and housing in the stateencroached land on the periphery of a landholding can be regularised. Forest areas were also allocated to small orchardists under a policy of giving land to landless and marginal farmers. But the practicewhich was tainted by corruptionwas discontinued from 1983. Packaging has taken a further toll. Poor packing is a major contributor to India's 20-30 per cent post-harvest losses in fruit. Baskets of fruit are usually poured into trucks and are cushioned by paddy straw en routeboth of which guarantee a minimum 10 per cent spoilage. Wooden crates give good protectionbut the National Committee on the Development of Backward Areas set up by the Planning Commission estimates that provision of crates for a ha of apple orchard in Himachal Pradesh required the annual cutting of 10 ha of forest -- about 20 per cent of the wood cut in the state during 1985 was for crates. The government stepped in when an alarm was raised about the impact on deforestation. In 1987it ordered the phasing out of timber-felling for apple crates and by mid-1990a complete ban was imposed. The ban coincided with a slump in the eucalyptus market in Punjab and Haryanaso sawmill owners started buying up suppliestaking advantage of a transport subsidy. Dr R S Ranaformer managing director of HPMCestimates that by shifting to corrugated fibreboard cartonsthe state would save 2000cubic metres of wood a year. A corrugated cardboard box factory was established in Shimlabut growers are unhappy because the cartons are more expensive. Some growers in Kulu Valley say fruit is damaged because the cartons do not stand up to the rough journey and become soggy and tear easily when it rains. Stokes who comes from the family which introduced apple orchards in the state in the 1920ssays: "I am not happy with the way the cardboard carton factory is working." Why has the government slashed subsidies on cartons when its use is being promoted as a wood substitute. Last year the state's horticulture director said the factorywhich runs at a lossproduced 20 lakh boxescompared with an annual requirement of 1.5 crore. Consideration is reportedly being given to a withdrawal of the transport subsidy to importers of eucalyptus wood from Haryana and Punjabbecause the cartons cannot compete with subsidised wood. A K Mukherjeeinspector-general of forests and the former chief conservator of forests in Himachal Pradeshis more optimistic. He saysThere is a complete ban on tree-felling for apple crates in the state. People have come to accept the new packaging material.But he admits the extension of apple orchards is exerting strong pressure on private forest lands. Apple cultivation ought to be regulated,he stresses. "There is already a glut due to the lack of proper marketing facilities. I hope the people will instead put the area to more productive uses. If unregulated extension of apple orchards goes onthe forest will be the first casualty." The HPMC has come under fire also for pollution from its processing unit at Parwanoo in Solan district. Waste fruit pulp is jettisoned into a major drainage channel. Stokes argues that "a little research and development could have solved the problem". Her farm uses pulp as cattle-feed and a plant is being set up to extract pectina soluble gelatinous sugar found in ripe fruits and used as a setting agent in jams and jelliesfrom pulp. "Why can't HPMC do the same?" she asks. Singh of G B Pant University warns intensive monocropping will result in disruption of water supplieschemical pollution and loss of soil nutrients and biodiversity. Pesticides worth Rs 30 million are consumed every year by apple orchards in the Kashmir Valley. "At presentapple cultivation operations may be regarded only as a contributory factor in the process of soil erosionsays Singh.In the years to comeit will be the most powerful cause of soil erosion." Vir Singh describes the attempt to use the apple economy to solve economic and nutritional problems as a mirage that will ultimately destroy the ecosystem. It is difficult to get the warnings heededhoweverbecause apples have been transformed from a humble fruit to a political hot potato. They play a pivotal political role in the state and support-prices for growers are a key issue during elections. C S Vaidyaresearch officer in Himachal Pradesh University's Agro-Economic Research Centretraces the birth of the idea of support prices to the production spurt of 1975-76which caused prices to tumble. He explainsWhile the input prices increased, the sale price of apples declined, giving a great setback to the apple industry in the state. But it was Congress(I) chief minister Virbhadra Singh who in 1981-82 made Himachal Pradesh the first state to introduce a support price for fruits. The structure of subsidies and support prices is designed to boost productionbut it benefits the bigger orchard owners rather than the small-scale and marginal farmers or agricultural labourers. In packagingfor examplewhen the volume of produce necessitated safe transportation to distant marketsthe state's forest department subsidised the sawmillsgenerally owned and operated by the large-sized orchardists. The supply of wood to make packing cases was effectively the first charge on the state's forests. In additiondespite a countrywide per capita daily fruit consumption of only 60 grams as compared with a minimum dietary requirement of 85 gramsthe fruit is sold to relatively well-off urban consumers in India and exported to affluent buyers abroad. Definitelyit's time the government stopped providing subsidised desserts to those who can afford to pay the real price for them. Based on reporting by S Rajendran (New Delhi)Anumita RoychowdhuryAnjani Khanna and Koshy Cherail (Himachal Pradesh)Ajit Menon (Amravati) and Shubhangi Mehrunkar (Jalgaon).